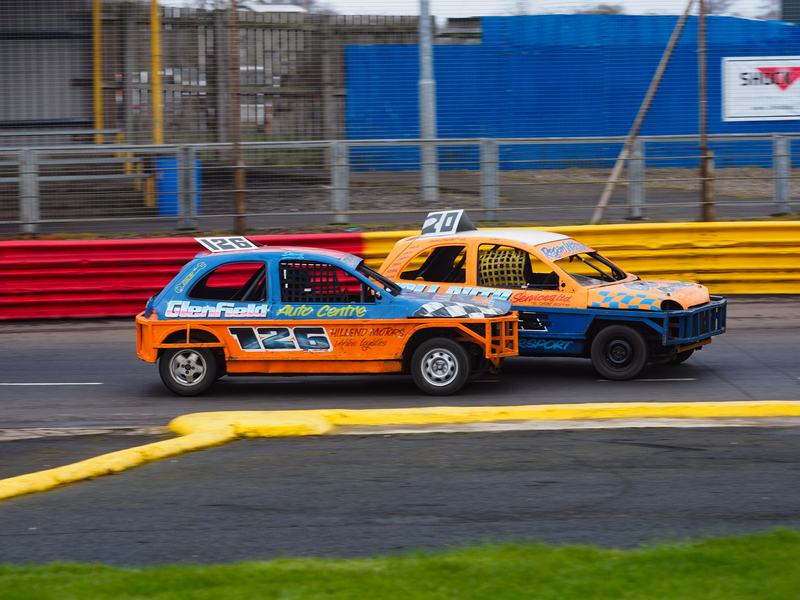 The sun was smiling on drivers, teams and fans as they descended on HRP Lochgelly Raceway once more this past Saturday for their weekly slice of stock car action at Scotland's premier short oval motorsports venue. It was an unusual programme of events that would see the night's action culminate with a Ramp Rollover event. The 2.0 Hot Rods were first on track and there were some notable returns as well as some smart new paintwork on show. Paul Carruthers and Colin Seath both made their racing debuts for 2018 and turned out immaculately prepared cars while Jim Pitcaithly and Billy Bonnar returned with the cars they had been using painted in their more familiar colour schemes - Ryan Mackie also appeared with what appeared to be a new car to him. As the lone white top, Colin Seath shot straight into the lead in his new Citroen Saxo and was going very well, holding on to the lead until after half distance as those behind him battled with one another. Kevin Stewart had overhauled Ryan Mackie in the early stages of the race and caught and passed Seath as the race moved into its third quarter and a lead that the Carnoustie man held on to until the chequered flag to pick up another race win. The second heat for the "tin-tops" saw Seath surge into the lead once more but Lochore's Billy Bonnar was on a mission and passed Seath before half distance and drove away from the field to take the win with only William Hardie offering some resistance as he finished in second but over a second behind. The feature final for the 2.0 Hot Rods was another fast-paced race that saw Dunfermline's Gerry Hendry disqualified due to loose bodywork on his Saxo before Paul Carruthers' car broke down on the inside racing line on turn four. Race Leader Kevin Stewart would have been gutted to see that yellow flag as it brought the likes of Hardie, Bonnar and World Champion Gordon Alexander into contention with just a few laps to go. Hardie made short work of overtaking Stewart and Bonnar wasn't far behind and these two held station until the end of the race as Polmont's Hardie took the win from Bonnar and Stewart. 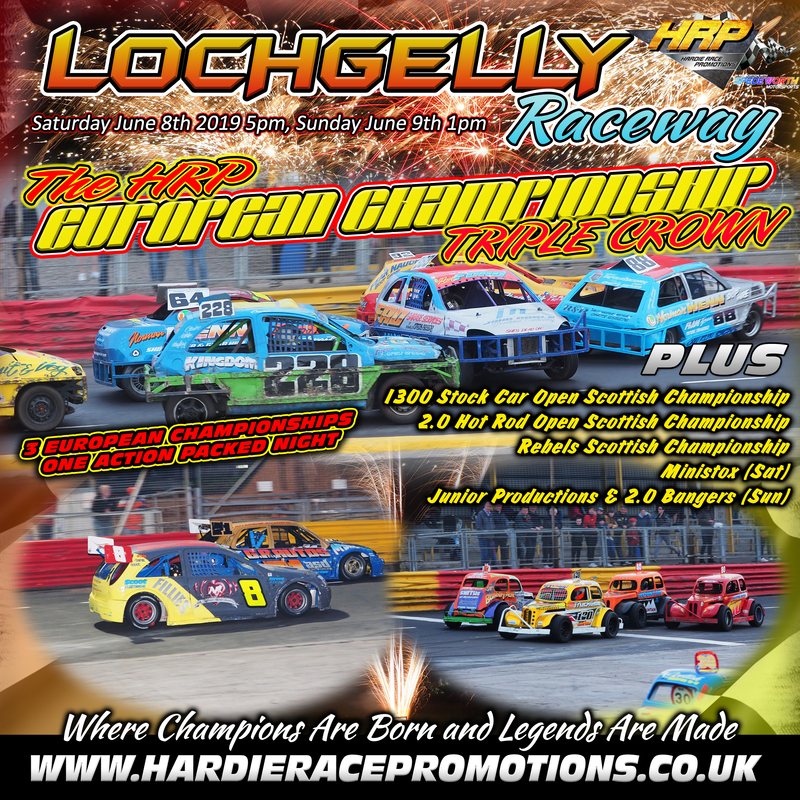 The Stock Rods were back at HRP Lochgelly Raceway as time hurtles on towards their European Championship at HRP Lochgelly Raceway on June 9th and 10th. 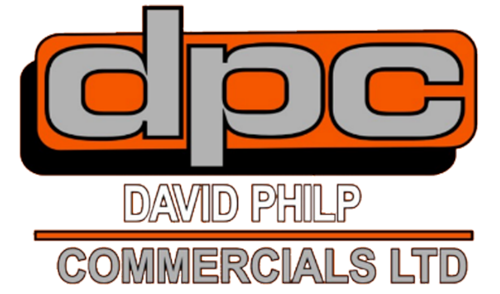 No visitors were in the pits; but a good number of home-based drivers were on hand to race over two heats and their feature final with David Crichton making his racing debut. Heat One saw Stuart Bannatyne made the early running; but Doug MacLean got his Vauxhall Nova to the front in the early stages and drove a controlled race to take the chequered flag with Jordan Wright coming home in second and National Champion Siobhan martin third. The second heat saw Bannatyne take up the running and he held on at the front for over half of the twenty-lap race before European and British Champion Chris Lattka hit the front and took his car to Victory Lane. The Feature Final started with Greig Clarke leaping into an early lead before Bannatyne took over at around quarter distance. Stuart was to hold on to the lead until Siobhan Martin arrived on the scene. The National Champion has been one of the fastest drivers all season-long and surged past Bannatyne for another race win for the top lady-racer in short oval racing (and one of the top racers period). Kelty's Darren McAlpine came home in second with MacLean completing a good night with another podium finish. The 1300 Stock Cars were racing in the first round of their 2018 Bill Auld Fabrications Trophy Series which carried enhanced prize money and it was good to see local man Ian Goodall back out for the first time this season. Jason Cutler led briefly before 2018 rookie Stuart Farrell took up the running and he would hold on to the lead as the chaos ensued behind him until the closing stages of the race when Scottish Champion Billy Wilson came on the scene and used the bumper to full effect to take a hard-earned win. The second heat was another frantic race with the bumpers going in throughout the field. It was Cutler who did most of the running from the white grade and it looked like he was on for another race win before the star duo of Paul Ford and Craig Haxton made their presence felt with Ford going from third to first in the final lap - great stuff! The Feature Final saw the grid closed up for the enhanced prize money feature and the bumpers went flying in from the start! 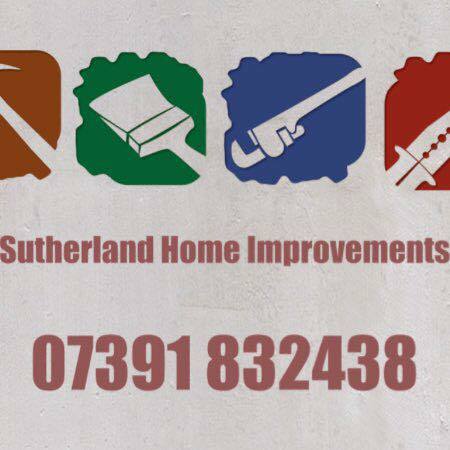 After the initial sort out, Paul Ford put on a clinic as he took his second win of the night ahead of Andrew Mathieson and Craig Haxton to round off an entertaining evening for the bumper brigade. The Ministox were also on track and, as always, a good number of cars were in the pits despite no English visitors. In his final meeting at HRP Lochgelly Raceway from white grade ahead of the big move to the red (star) grade; Scott Allardyce managed to keep his car in front of National Points Champion Sean Naismith to take yet another win to add to his amazing start to 2018. Heat Two was punctuated by a heavy crash for another of the top performers of 2018 as Barry Scott made heavy contact with the safety barrier. On the resumption of the race, Naismith made no mistake as he sliced through the pack to take the win. The feature final saw the Ministox produce another high-quality spectacle which belied the tender years of the junior drivers as they ripped around the HRP tarmac at a frenetic pace. Having recovered from his big impact in heat two; Barry Scott showed no adverse effects as he stormed to the feature win ahead of star duo Naismith and Lochgelly's Danny Whyte in one of his final meetings before moving up to 1300 Stock Cars. The Bangers had requested an opportunity to race at this event and it was a shame to see so few drivers honour this request. Jason McAlpine took the only race win as the only finisher in a short race where the other contenders were all eliminated in a heap; before he brought a close to proceedings with a spectacular Ramp Rollover which saw his car looking decidedly second hand afterwards. 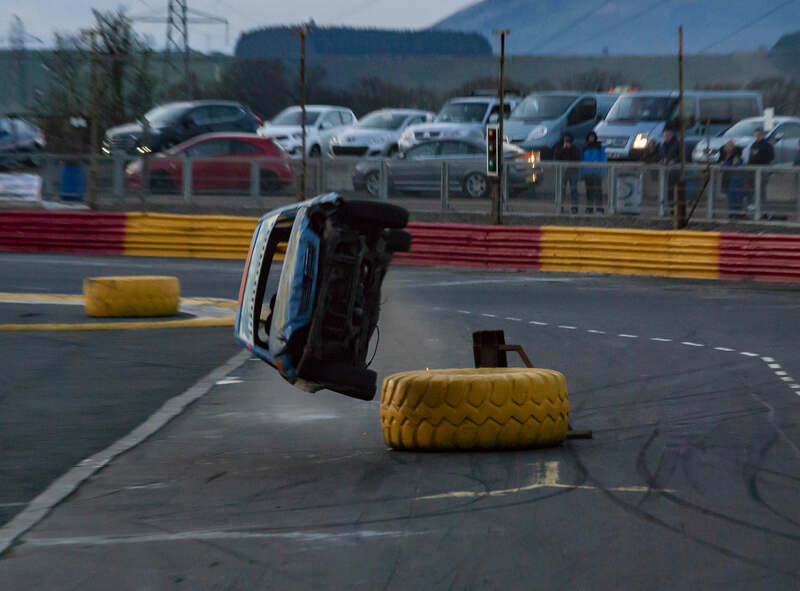 The driver was keen to go again but the car was not as willing and so another night of high-octane action came to a close at HRP Lochgelly Raceway. This week sees another five formula event at Scotland's premier short oval motorsports venue as HRP Lochgelly Raceway presents Round One of the 1300 Stock Car MR Coachworks and Ringtone Racepaints Series, Stock Rods, CC Rods, ProStocks and Ninja Karts from 5:30pm at HRP Lochgelly Raceway!